For over a decade, Dwayne Johnson has been talking about his role as Black Adam in the DC movie universe. He first brought up the role way back in 2008 on the set of Get Smart. And fans have been awaiting the antihero's arrival on the big screen ever since. 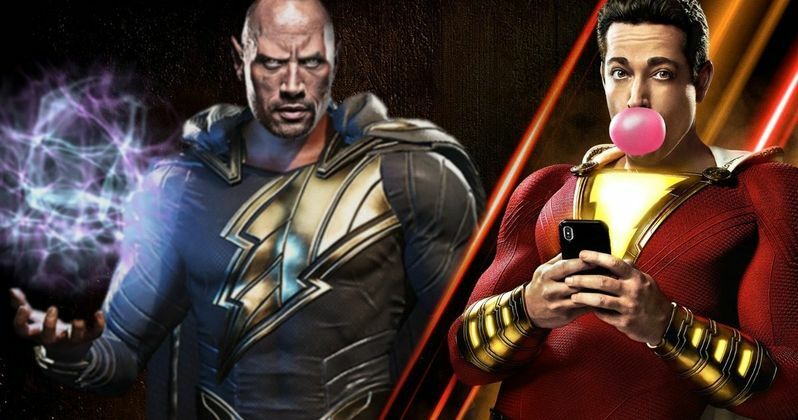 There was talk for awhile that Black Adam would be getting his own standalone movie before Shazam!. But it ultimately didn't work out that way. The original 'Captain Marvel' is coming to theater screens soon. But Black Adam won't be coming with him. Why did it happen that way? For years, fans have been way more excited about seeing The Rock as Black Adam than they have been about seeing Shazam. That tune changed once the first trailer landed at Comic-Con this past summer. But some are still wondering why Black Adam was left on the sidelines. Director David F. Sandberg and producer Peter Safran recently scented some footage for a select group of journalists. And they were pestered quite a bit about The Rock's absence, which still doesn't make sense to some. David F. Sandberg had this to say about why Dr. Sivana is the main villain, leaving a sequel open to the inclusion of Black Adam. "Sivana is kind of the oldest villain for Shazam. It was always that; when I came on board it was always Sivana - because I think they sort of played with the idea of having the first movie be both Shazam and Black Adam, and felt like it needs more setup than you want to spend in the first movie, Shazam! We want to introduce him first before..."
The director was cut short before he could finish his thought by his producer. Peter Safran also has thoughts on why we won't see Black Adam fighting in Shazam. He goes onto say this. "Shazam's origin story is big enough to merit its own film, and I think that's really what everybody discovered early on, and when you see the movie you'll see that that's what it deserved. And that's what it got." You want to see it at some point, because it's a classic villain." "He's a perfect adversary, so one would hope that eventually you see those two on screen together - at some point. But it's not in this one." So it could be a couple of years before DC fans get to see The Rock on the big screen as Black Adam unless an unexpected cameo drops somewhere down the line. The DCEU is in shakeup mode, and is splintering off in different directions. So it's too unpredictable to guess what will come of all this. Though. everyone seems to be enjoying the Shazam footage thus far, and a sequel seems quite likely. The first movie is zooming into theaters this April. These quotes come from Cinemablend.